Candis Dart is the Coordinator for the Door County Partnership for Children and Families. She has been in this role since October 2016. Prior to this position, she lived in Indiana, where she worked as a 4-H Youth Development Extension Educator. She currently lives in Brussels with her husband and two children. 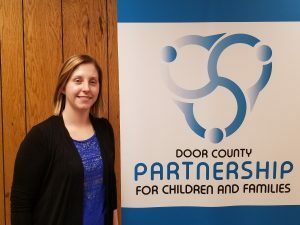 In her role at the Door County Partnership for Children and Families (DCPCF), a program of United Way of Door County, Candis works closely with many organizations and the other DCPCF staff members to provide resources and opportunities for Door County children and families. One of these opportunities is the Dolly Parton’s Imagination Library program, which the DCPCF is in the process of bringing to Door County children.